Even though the onset of monsoons provides a huge relief from the hot summer season, no doubt, the rains also bring with them a number of other issues; flooded roads and mosquitoes for example. So to make sure that you are able to take care of your little one flawlessly all through this season, here are some things that you can keep in mind when picking out your baby’s monsoon clothing. During the rainy season, the chances of the weather changing several times in a day are numerous! A typical day during the monsoon season can start off as hot and humid and then, after a rain spell, cool down quite liberally! Keeping these sudden temperatures in mind, you need to figure out how to dress your baby! Layers are your best and safest bet. Having one or two things like a cotton cardigan or even a light cotton blanket handy could go a long way in helping your baby stay weather-proof. If, on a given day, the weather gets colder, you can always throw the blanket or the cardigan on your little one and make sure that they do not feel cold. Light coloured clothes are your little one’s best friend right now, but make sure they are full sleeved and cover your baby’s entire body. This helps prevent any potential mosquito bites to your baby. The light coloured clothes not only help keep your baby cool, but they also do not attract mosquitoes which dark coloured clothes do. Always remember that your baby is obviously more sensitive to the change in the weather when compared to you. Keeping this in mind, you also need to remember that your little one will usually need an extra layer of clothing than you. 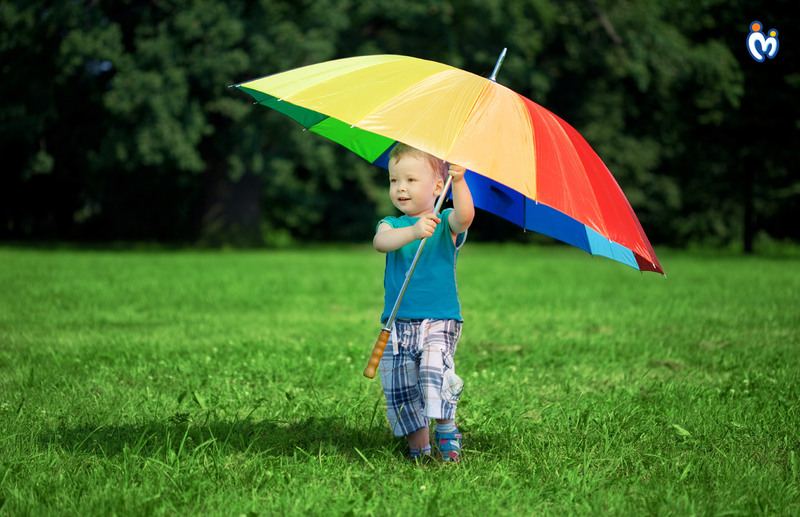 Observation is another key factor when it comes to cloth-proofing your baby in the monsoon. If you notice that your baby seems uncomfortable and his/her tummy is cold, then your baby probably needs an extra layer to keep warm. If on the other hand, your baby seems to be sweating, then removing a layer, or switching on the air conditioner could really help your little one cool down. Buying an extra set of clothing is going to be really helpful since, in the humid weather of the monsoons, clothes tend to dry slowly. Monsoons are tricky, but you can make sure that your baby remains mosquito free and weather-proofed all through it by merely selecting the right kind of clothes for him/her. Just keep these things in mind and you will do just fine!